Whew! I'm back from my service trip to Belize — I had an AMAZING time! The country was wild and beautiful, the people of Belize friendly and hospitable and the food was so very delicious. We all had a wonderful week. Our Meadowbrook team was just incredible. Every student and leader stepped up when it counted and gave of themselves every single day. It was exciting sharing Jesus' love with the people of St. Margaret's Village. The staff of Praying Pelican Missions, who managed our trip, did a superb job providing for our team. I have to send special thanks to Matt, Tatiana, Laura, Bree and John for a great week in Belize! I have many stories to share: wild bus rides on the Hummingbird Highway, tons of village kids waiting for our bus to arrive every day, a visit with a Mennonite family, sharing their home-made pineapple juice, and discovering that the Internet reaches to remote Belizean villages. Those stories will come as I catch up at home and work. Meanwhile, I'd like to share a set of Belize Sketchnotes. 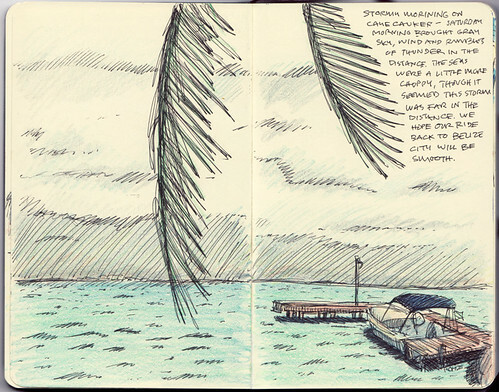 I'd hoped to do more sketching in Belize, but there just wasn't time in such a compressed week. Thanks to all who prayed for us — we felt your prayers in Belize. Great sketch! That's exactly how it looked while I was there. Aren't the "highways" in Belize fun? Jon, thanks! I wasn't so concerned with perfect capturing of imagery, but more impressions of what I was experiencing. When I woke early on the last day (Saturday) I wanted to capture the Caye from our spot at the Anchorage Resort. Glad you liked it! Yes, the highways are fun. I didn't think about it but we never encountered a traffic light in Belize since there are so many roundabouts used for major intersections. Glad you made it home safely Mike. Sounds like a fantastic trip. I checked out all the sketches too. WOW! Well done! Looking forward to another lunch together soon! I like your blog very much. Actually, I downloaded all your archive blogs to my sd card to read in my treo 650 with Isilo. I think it has been around several hundredd entries, right? By reading your blog, I know more about your life. I like your thoughs on palm, pda and moleskine and logo design. It is the most interesting blog I have ever read. I think you are the only Chinese reader I am aware of -- where in China are you located? I live in Shanghai. And i find your blog by searching treo information. Actually I am a new user of Treo 650, quite new, only four months, but to be a palm addict. Have you ever visited China? or any plan? Very nice wrok, Mike. As you know, I love your illustrated journaling style, and you continue to inspire me to work on my own. Keep up the great work.....I look forward to your next installment! wrok??? ?.....I need more coffee....that would be work....or maybe wokr?? Phil � thanks for the nice welcome back words! Kirk � Thanks for the encouragement! I was worried about the style of my sketches as I started working out how to do them, but now I've just stopped worying and have been enjoying expressing myself in them. So, I'm glad if it encourages you too!